We all go to that place sometimes, that depth from whence the hope of light becomes a mere star within the jet black vortex of a midnight sky. For darkness sings, and does so in a strangely unforgiving, brutal voice that terrifies but nonetheless invites you in, and grips you tight, allowing you to fester in its hands. Doom Metal is a genre that can often border on the Avant-Garde – for not all music enthusiasts may be willing to submit their souls to the pits of despair only to bask in the ambiance of sorrow. Yet for all its lugubrious connotations, Doom Metal is also known for its melancholy beauty and poignant melodic constitution, which in turn makes it one of the most compelling outlets for that darkness within. Brazilian self-proclaimed Funeral Doom outfit HELLLIGHT indeed appear to be experts in gloom and all of its constituents, and yet it is that bright spark of pure emotional fortitude that brings their new EP “As We Slowly Fade” of out of the shadows and into the light. This EP is indeed a haunting one – and I’m not talking about a state-based spectre with franchise potential. Listening to “As We Slowly Fade” feels more akin to stepping inside Edward Munch’s “Scream” only to discover just how deafening silence can be. The mesmerising, insightful “Intro” lifts the cool veil off this enterprise and invites the listener into an atmospheric world of passion and grief. And as the title tracks creeps in with twinkling drops of piano keys, the listener becomes undoubtedly aware of just how grandiose this endeavor into the shadows really is. The track, punctuated with sinister tremolo picking and dark, molasses-slow chords, speaks to the soul in spoken-verse and monstrous growls, before raising the dead with clean vocals that are quite worthy of finding their way onto a Prog. Rock record – a true Lazarus effect. There progressive influences certainly hold prominence here. 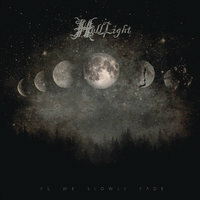 Although “As We Slowly Fade” may at times be punctuated by the obligatory - albeit trivial - heaviness of sluggish Doom offerings like “Bridge Between Life and Death” and “The Land of Broken Dreams”, the grim ambiance of this record truly comes to light through progressive offerings like “While the Moon Darkness” and “The Ghost” that raise this tome from a meditation upon misery to an exploration of ways through and out of its depths. The tracks, with their simple yet prevalent melodicism, organ-esque keyboards a la “Mister Crowley”, and tasteful lead guitar work, enthrall the listener in this somber experience and illuminate what otherwise might have been another black hole of an abyss with flares of inspiration. However, HELLLIGHT truly come to shine on the closing track “Ocean”, which sees the band invite an angelic female presence to take this lengthy finale to new sanguine heights. “Ocean” is a composition that manifests beyond traditional Doom boundaries and becomes an envisioning of epic verse wrapped in the penumbras of thick chords and levitating piano notes; thus becoming not just a journey through a darkened wood, but a way out of it. Although the pacing of “As We Slowly Fade” may be a touch too lethargic for some, it serves its purpose in retaining the listener within a state of constant emotional frailty and listlessness that may be associated with the deep uncertainty of pure darkness, and the marvelous production makes this seemingly simplistic record sound uncompromising huge - thus turning a seemingly shallow pit of despair into a bottomless vortex of possibilities. Overall – if Edgar Allan Poe was alive in this day and age, then “As We Slowly Fade” would certainly have made it into his record vault. On this mighty and moody EP, Brazilian duo HELLLIGHT clearly show that even within something as arresting as the dark, one can create a gem that truly shines.